When growing melons in an unheated greenhouse you will have three options. The plants can either be container grown, planted straight into the ground, or grown on using a grow bag. 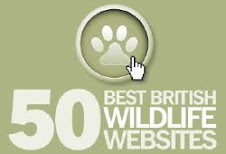 By far the best option would be to plant your seedlings into the ground – especially if it has been well prepared by the addition of plenty of well rotted farmyard manures – so long as it is suitably free draining and has a pH of between 6.0 to 7.0. Consider planting melon seedlings into raised beds if your climate is too cold, humid or if your soil is too heavy to be free draining. If you are growing melons in a greenhouse it is reasonable to expect that any young plants would have been shop bought or germinated under protection. In both cases, the seedlings can be planted out into a cold glasshouse once the seedlings have produced two or more true leaves. This can be done any time from April onward. 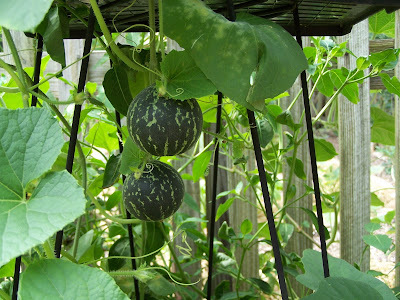 The next thing to do is to create some support for you melon plants as they grow. This can be a piece of secured trellis or a single line of string tied to the supports in the glasshouse roof and secured in the ground with a peg next to the base of the melon plant. 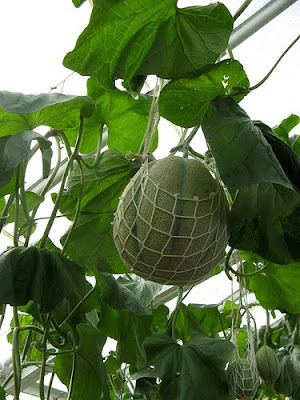 As the melon begins to grow you should secure the strongest shoot to the support with a soft jute string and pinch out any side shoots growing out from the main stem. Once the main stem has reached the top of the support, pinch out the leading shoot. This will help bring the plant into flower and allow it to concentrate its energy on the formation of fruits. Watering holds the key to successful melon growing, and perhaps the best way to water is with a drip irrigation system - unfortunately this is a luxury that few of us have. For the rest of us, when watering melons only water them at the base of the plant making sure that none of the foliage becomes wet. Melon leaves can be very prone to fungal infections which will reduce the size and quality of your crop. You can also consider the practice of sinking a suitably sized pipe into the ground next to the plants root system – try not to damage any roots when doing this - so you can water directly into the root environment. Remember that it is all about trying to maintain an even root environment so try and avoid over and under-watering. Over-watering is particularly damaging as it can cause the fruits to split. Glasshouse conditions can become extreme during the height of the summer. To prevent your crop from suffering heat damage try to raise the humidity within the greenhouse on the hottest days. 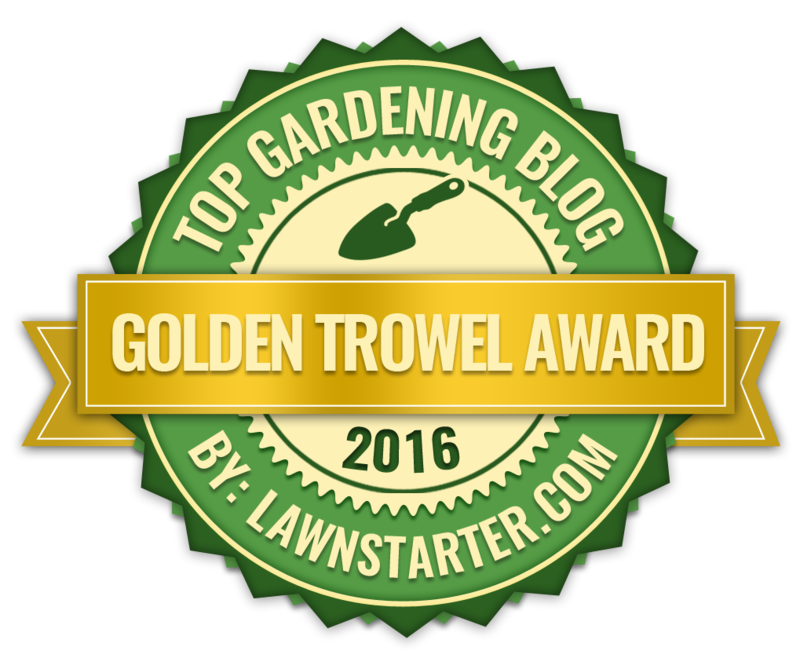 This can be achieved by watering the greenhouse paths early in the morning or by standing a bucket of water in the middle of the glasshouse. However, good ventilation is also necessary in order to help reduce the incidence of fungal infections so make sure that windows and doors are kept open during the core day. Remove older leaves from the base of the melons as this will also improve air circulation around the plants. In the open ground your melon flowers will be naturally pollinated by native insects but under greenhouse conditions this is less likely to happen as the structure will act as a barrier. Of course, no pollination means no crop, but once the flowers have opened you can pollinate them manually. Using a small, soft paintbrush, lightly brush each flower in turn. This practice is best carried out midday when the humidity is high. After 2 or 3 days you should remove the male flowers as these will sap the plants strength as they grow - the female flowers are easily identified by the embryonic melon growing behind the flower. As soon as the fruits reach the size of tennis balls they are going to need some support. Use string nets or old nylon stockings to take the weight off the plants framework and secure them properly to support wires, trellis or the greenhouse frame. As the summer progresses and the fruits mature to full size, remove a few leafs to allow the fruit to ripen. 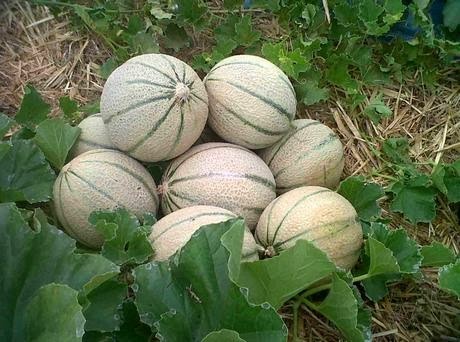 Wait until melons are fully ripe before you remove them from the parent plant - they won't be able to ripen off the vine.